Medical and law school graduates with six-figure debts aren’t the only ones who can benefit from student loan refinancing. According to a new study by NerdWallet, if you have another type of advanced degree, you could also save thousands of dollars. For example, if you have a Master of Fine Arts, you can save an average of $4,575 by refinancing, and grads with a Master of Education or Teaching can save an average of $4,272, NerdWallet found. Graduates can refinance their loans to reduce interest and monthly bills after two years of regular payments on a 10-year loan. Advanced degrees come with a high price tag, and the more in debt you are, the more likely you are to save by refinancing. Since law and medical school graduates have the highest median debt among popular graduate programs, they’ll likely save the most. On the flip side, graduates with a Master of Business Administration or a Master of Social Work have the lowest median debts, so although they can save by refinancing, they’ll have the least to gain. Refinancing student loans involves changing the terms of repayment. For those who qualify, a financial institution or private refinancing company will replace the existing loan or loans with one single loan at a lower interest rate. Benefits include having just one monthly payment and paying less in interest throughout the life of the new loan, which typically lasts 10 years. The new terms could also extend the time frame in which borrowers are expected to finish repaying the loan. This would lower the monthly payments but increase how much is paid in interest. Refinancing might not be in your best interest, even if you qualify. If you refinance your federal loans into a single private loan, you risk losing certain advantages, such as flexible repayment plans, public service loan forgiveness and interest-free deferment on subsidized federal loans if you lose your job. 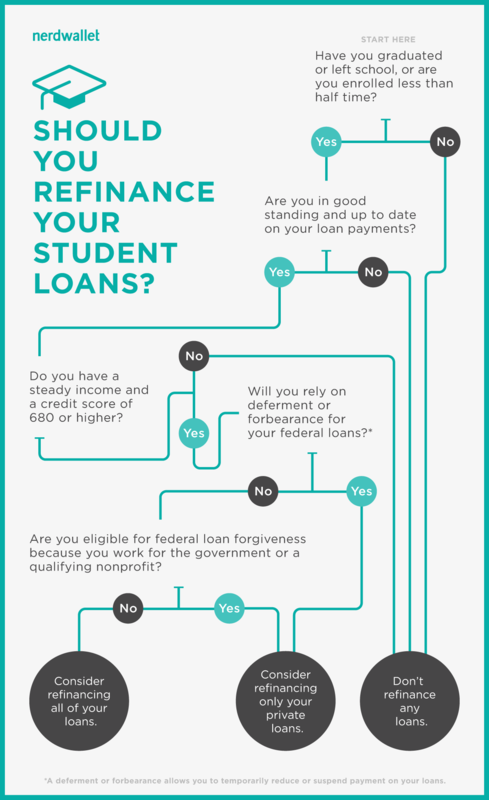 It’s important to research all student loan repayment options before you decide to refinance. You have a good credit score. Refinancing companies consider grads with scores in the 690s or above to be the most reliable. If you have a lower score, you might be denied or your refinance options might not offer a better rate. You have a steady income and job security. Lenders want to make sure you can pay them back. A full-time job makes you a more reliable candidate to make monthly payments on time and in full. You’ve made steady payments for at least two years. Desirable refinancing candidates demonstrate a positive track record of consistently repaying their loans on time and in full each month. If you’ve done that for at least a couple of years, you’re seen as less risky. Most of your loans are private. You’ll save more by refinancing private debt because the average annual percentage rate on these loans is typically much higher than the APR on federal loans. You have high debt. Refinancing is most beneficial if you have high debt. You need to have at least $7,500 in total loans to consider the option. The priciest advanced degree is a doctorate in medicine or osteopathic medicine. The median debt for medicine and health science graduates is $200,000. Without refinancing, these grads will pay $279,099 over the life of a standard loan. After refinancing, these degree holders will see the most savings — $13,663 over the life span of the new loan. Graduates of law programs have the second-highest median debt among those with advanced degrees — $149,400. Without refinancing, those with a law degree will pay an average of $207,886 over 10 years. By refinancing, they can save $9,801 on average. For those who don’t refinance their federal loans, another potential money-saving option is the Public Service Loan Forgiveness program, which is available to federal student loan borrowers who are employed full time by the government or nonprofit organizations. After 120 months of payments, those who qualify can have the remaining balance on their Direct Loans forgiven. A doctorate in pharmacy is one of the most expensive advanced degrees. Graduates leave school with a median debt of $132,674. Without refinancing, these degree holders will pay an average of $183,994 over the course of 10 years. After refinancing their student loans, graduates can save $8,286 on average. Several fields within arts, humanities and social sciences fall under the umbrella of Master of Arts. The median debt carried by these graduates is $58,702. Without refinancing these loans, the average amount a degree holder will pay over a standard 10-year term is $83,389. Refinancing can save graduates an average of $5,003. A Master of Fine Arts includes a wide range of artistic disciplines. These graduates end up with a median debt of $65,305, the fourth-highest on our list. Without refinancing their student loans, graduates will pay $91,301 on average during a standard loan term. After refinancing, these degree holders can save $4,575 on average. One out of every five master’s degrees awarded in 2012-2013 was in the field of education, according to the Bureau of Labor Statistics. Those with degrees in education carry a median debt of $52,500, but end up paying an average of $74,280 during a standard 10-year loan term. By refinancing, they can save $4,272 in payments over the life of a loan. As an alternative to refinancing, certain highly qualified teachers may be eligible for Teacher Loan Forgiveness, a federal program offered to borrowers who teach full time in a low-income community for five consecutive years. Perkins Loan borrowers can qualify for loan cancellation if they teach at least one year in a low-income community or a special education classroom, or in a subject area with a shortage of teachers in their state. In the field of science, technology, engineering and math (STEM), a Master of Science is in high demand in the job market. Computer science, for example, is the second-most sought-after master’s degree among employers, according to the Job Outlook 2015 study from the National Association of Colleges and Employers. These degree holders have a median debt of $51,433. Over the course of a standard 10-year loan, they’ll pay an average of $71,902. By refinancing, a graduate could save an average of $3,600 over the course of the new loan. A master’s in business was the most popular advanced degree awarded during 2012-2013, according to the Bureau of Labor Statistics. Those with a Master of Business Administration degree carry a median debt of $42,928, the lowest on our list. On a standard 10-year repayment plan, these grads will pay an average of $60,159. After refinancing, they can save an average of $3,103 over the life of the loan. Graduates with a Master of Social Work have a median of $45,095 in loans, some of the lowest debt among advanced degree holders. By not refinancing, they’ll pay an average of $62,898 over the life of the loan. After refinancing, their average savings over time is $3,059. Those with a Master of Social Work who work full time for government or nonprofit organizations could qualify for Public Service Loan Forgiveness, but only if they don’t refinance their federal loans. Median debt numbers come from the National Postsecondary Student Aid Study 2012, National Center of Education Statistics. Historical federal interest rate data are from studentaid.ed.gov. Historical private interest rate data are from the Consumer Financial Protection Bureau. Refinanced interest rate is from data provided by Credible. Infographic by Enrico M Limcaco. Will Refinancing My Undergraduate Student Loans Save Me Money?